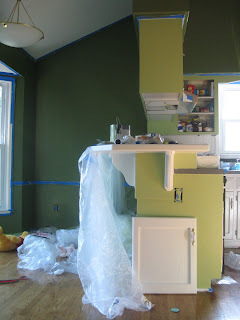 It's been two weeks since we've started painting our kitchen . . . and it's still a work in progress. 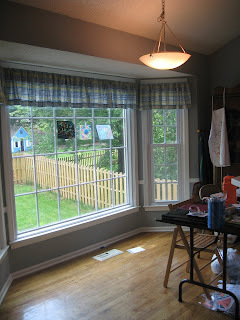 The bay window - I absolutely love all the light that pours through all day long! This extremely cluttered area is where we decided to put my new "office/work" area. We moved my mom's cabinet to the dining room. The new desk area will go from the bar across the area the cabinet was, to meet the wall where the bay window begins. 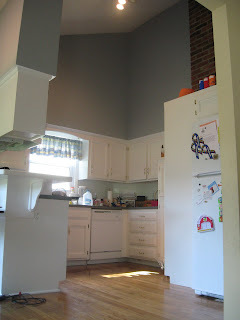 As you can see, the kitchen had a very gray and white theme going. 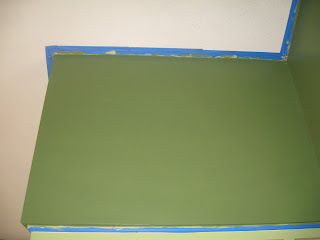 The new colors we chose are Grape Vine (a dark olive green color) and Grass Cloth (a pretty lime green). They sound really odd, but I saw a picture of them together in a Home Depot catalog and loved it. Grape Vine will be for the walls & Grass Cloth will be for the kitchen cabinets. All of the trim will be Polar Bear White. 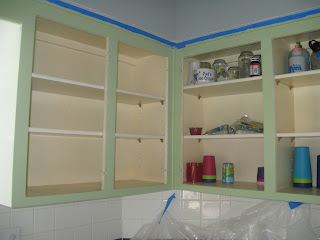 During the week before Father's Day, I gradually started painting the cabinets. I removed the doors off the first half I wanted to work on. Currently, the doors have taken up residency in my hubby's side of the garage. His poor car is stuck parking in the drive until this project is complete. 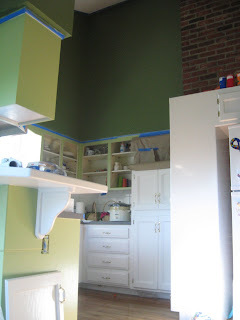 After the doors were stowed away, I primered, then painted the first half of the cabinets. I was really worried about the Grass Cloth color cause it looked horrid next to the gray. 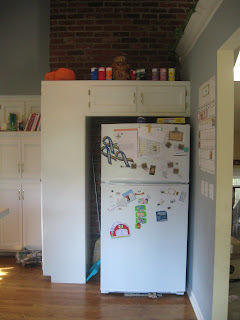 During my writing breaks, I would go to the garage and work on the cabinet doors (which are about 3/4's done). A huge portion got done during Father's Day weekend. On Saturday, we primered all the walls. The funny thing about that - we realized Home Depot put the primer labels on the wrong cans. 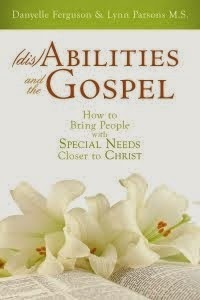 The primer for the Grass Cloth had been a bluish-green - and the primer for the Grape Vine had been a limey green. Hmm . . . I wonder which should have gone with which? 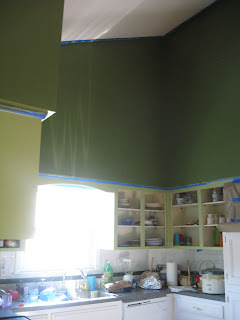 Anyway, after primering on Saturday, the kitchen looked super slimey-green. Holy Moly! I couldn't wait to get the Grape Vine coat on, so . 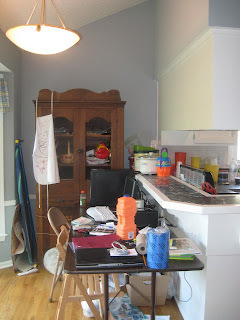 . .
Our kitchen sat like this for another week. And today, John and I painted on the last coat of Grape Vine. 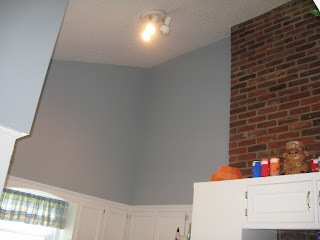 Then we got to take down the blue tape, and voila! Our kitchen is about half way done! 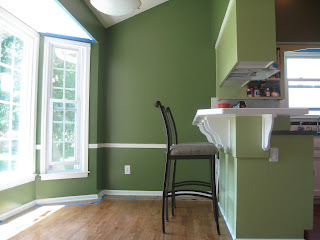 I love how the Grape Vine gives the kitchen depth while the lighter Grass Cloth brightens the room. About a month ago, I was taking my babysitter home and passed a yard sale with these bar chairs for sale - for only $25!!! They're in excellent condition. 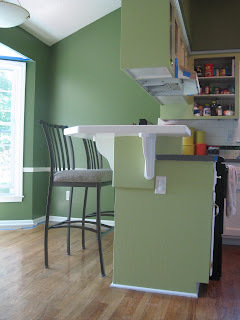 When the kitchen is finished, I'm going to buy new fabric and reupholster the chair seats to match the kitchen. This picture really turned out super dark, but I wanted to show you the window with the white trim. 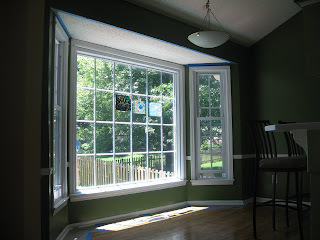 Actually, all of the trim will be painted last - but I love the contrast of the darker Grape Vine color and the white. So, what do you think? 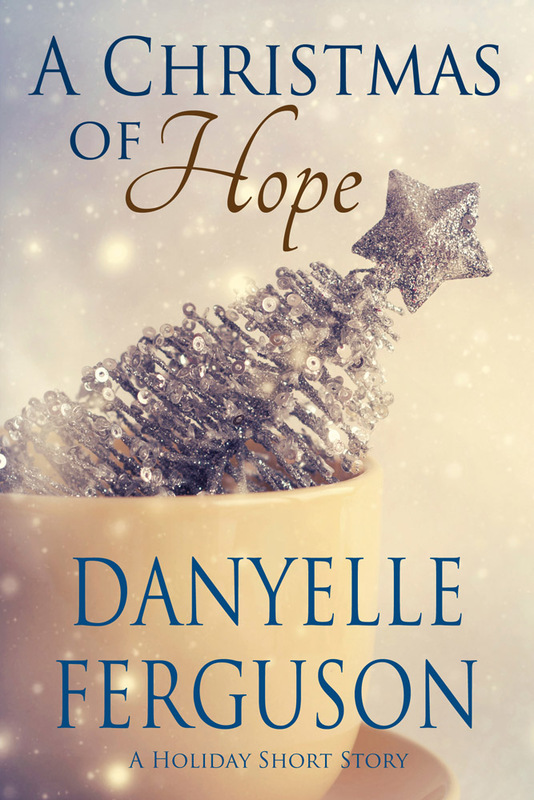 I'd love to hear your feedback! What's left to do? I need to finish the cabinet doors for the first half I've started. Then I'll start on the second half of the cabinets and doors. After that, there's the trim to paint. Not to mention painting, putting together, and installing the custom desk area. I'll be sure to post updates as we make more progress! 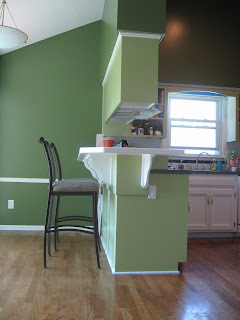 You're right--I never would have put those colors together on my own, but they look GREAT in your kitchen! Big job, but way to go! What a difference just some paint can make! Your new kitchen looks fantastic! I love the colors and the white trim does look pretty cool against the greens. I can't wait to see the custom desk area. It looks terriffic! You did what I want to but am too afraid to do! I want to paint with colors, but I wouldnt know where to start or what to paint which colors! LOL! Ooh, Robin . . . I'd have so much fun with your house! My suggestion - go to home depot and pick up all their free paint catalogs w/ the paint samples. Then go back home and start going through them. Find some colors you really like, then find complimentary colors to go with them so there's a nice flow from room to room. Call me if you want more details! Beautiful Danyelle! What a lovely kitchen. It will make for a super great writing space too! Thanks, Ali. I hope your summer is going well! Erin - You're always welcome to come up!!! Whow! Looks amazing already! Can't wait to see the final product!